The present studies aim to expand research on dehumanization in the work domain by exploring the biologization – an unexplored form of dehumanization that involves the perception of others as infected and contagious – of physically tainted workers. By integrating the literature on biologization with that of disgust and physically dirty work, we expected that the biologization of workers would be explained by their dirty work environment and by increased feelings of disgust towards them. In Study 1, we showed that focusing on a dirty work environment (vs. on the person performing the work) increased feelings of disgust towards workers and, in turn, their biologization. Coherently, in Study 2, we found that a physically tainted occupation (vs. baseline condition) increased participants’ feelings of disgust and biological dehumanization towards the worker. In contrast, a non-physically tainted occupation (vs. baseline condition) had no effects on disgust and biologization. The theoretical and practical implications are considered. Biologization is a form of dehumanization that involves the perception of others as infected and contagious (Savage, 2007). This dehumanizing process employs metaphors linked to disease, purity, and protection of cleanliness (Douglas, 1966; Volpato & Andrighetto, 2015). In recent decades, biologization has drawn the attention of several theorists (e.g., Hirsch & Smith, 1991; Savage, 2007; Sontag, 2002), who have revealed that biological rhetoric and metaphorical language have been widely used in relation to genocidal episodes. In particular, Savage (2007) argued that metaphors defining enemies as cancers, bacilli or viruses exacerbate the perceptions towards outgroup members in terms of threat and provide group members with a justification for collective violence. For example, Hitler’s Mein Kampf included the conceptualization of Jews as harmful bacilli (Musolff, 2007). In a more recent and different context, Steuter and Wills (2010) analysed the dehumanizing metaphors used by Western mass media to describe terrorism and terrorist enemies and revealed that they often included biological metaphors such as cancer, metastasis or viruses. Thus far, biologization has been theoretically examined within conflictual interethnic relations. However, this form of dehumanization may also emerge within other domains and target different social groups. Drawing from the theoretical concept of ‘dirty work’ (Hughes, 1951, 1958), the present research aims to show that metaphors conveying biologization may also be used within the work domain and shape laypeople’s perceptions of certain occupational groups. In particular, the sociologist Hughes introduced the concept of ‘dirty work’ to refer to occupations that are perceived as disgusting and immoral. In this respect, Ashforth and Kreiner (1999) argued that these activities are connected with three different types of taint: social, moral and physical. Social taint arises when a worker occupies low-status and low-power positions and has a subordinate relationship with others (e.g., butlers or waiters). Moral taint occurs when a worker is thought to employ methods that are deceptive or immoral (e.g., bill collectors or pawnbrokers). Finally, and crucially for the main goal of the present research, physical taint occurs when an occupation is thought to be performed under particularly dangerous conditions (e.g., soldiers or firefighters) or is directly associated with garbage, dirt, and effluent (e.g., garbage collectors or sewer workers). Considering that people are associated with disease especially when they are perceived as lacking hygiene and being in physical contact with dirt (Faulkner et al., 2004), we hypothesized that the biologization of workers would be elicited by the dirty environments in which they work. Importantly, as we will discuss below, we expected that the relationship between the dirty work environments and the biologization of workers would be explained by increased feelings of disgust towards them. Disgust is widely regarded as an innate and a highly unmodifiable emotion that deeply shapes how people react towards others (Rozin, Haidt, & McCauley, 2008; Russel & Giner-Sorolla, 2013). Accordingly, a large amount of social psychological literature (see, e.g., Buckels & Trapnell, 2013; Hodson & Costello, 2007) has shown that disgust is a relevant emotion in the intergroup domain that shapes, for instance, negative attitudes towards immigrants or deviant individuals (Faulkner et al., 2004; Hodson & Costello, 2007; Navarrete & Fessler, 2006). Interestingly, some studies revealed that this association was mediated by a fear of being contaminated by outgroup members (Faulkner et al., 2004; Laakasuo et al., 2017; Navarrete & Fessler, 2006). Furthermore, Neuberg and colleagues (Neuberg & Cottrell, 2002; Neuberg, Kenrick, & Schaller, 2011) speculated that disgust motivates contaminant-minimizing behaviours, including the desire to avoid and/or eliminate the contaminant (see also Dutta & Rao, 2015). In parallel with these studies, Harris and Fiske (2006) found that members of certain disgust-eliciting outgroups fail to be processed as fully human. Through an fMRI investigation, the authors found that only extreme outgroups, groups that are low in both warmth and competence (e.g., the homeless) had activated insula and amygdala, a pattern consistent with disgust. In line with these investigations, Buckels and Trapnell (2013), by examining the influence of disgust on outgroup dehumanization through a modified version of the Implicit Association Test (IAT; Greenwald, Nosek, & Banaji 2003) and a minimal groups paradigm, found that all participants demonstrated a dehumanizing bias whereby outgroup members were more strongly associated with non-human entities than were ingroup members. Crucially, feelings of disgust significantly potentiated this dangerous cognitive bias. Furthermore, the authors found that this effect was distinct from sadness, which showed little influence on dehumanization. Disgust thus appears to have the unique capacity to foster social-cognitive dehumanization of outgroup members. Relevant to the present research, Tipler and Ruscher (2014) also argued that disgust is strongly linked to nonhuman metaphors concerning disease, purity, and protection of cleanliness. There is a growing body of evidence indicating a functional linkage between disgust and disease avoidance (for a review, see Oaten, Stevenson, & Case, 2009). Disgust is triggered by categories of people who were more likely to carry pathogens, which pose a more acute threat to fitness (Case, Repacholi, & Stevenson, 2006; Curtis, Aunger, & Rabie, 2004) or who are stereotypically associated with specific types of infectious disease (Cottrell & Neuberg, 2005). Why does disgust play such an important role in determining the avoidance, rejection or even dehumanization of others? According to Nussbaum (2010), disgust is commonly felt towards a wide range of primary objects, such as faeces, blood, corpses or decaying meat. This primary disgust can be then projected onto an individual or an entire group that is culturally perceived as contaminated by these disgusting primary objects. Summing up this idea, Rozin, Millman, and Nemeroff (1986) defined the principles of projective disgust as ‘laws of sympathetic magic’: if object A is disgusting and B looks like A or comes into contact with A, B is also disgusting. Nussbaum (2010) stressed that projective disgust has no reliable connection with a genuine danger of being contaminated by outgroup members; it is instead a cultural product, a powerful means of creating social hierarchies that are politically used to subordinate low-status social groups or certain workers. History provides us with different instances of how projective disgust is culturally used to subordinate and socially exclude workers who operate in degrading and dirty environments. The most impactful example is perhaps that of Dalits in Hindu tradition. The ‘untouchables’, or Dalits, are people who perform physically unclean work in an occupation that puts them in contact with soiled objects. For example, Dalits cremate the dead, clean latrines, remove dead animals from the roads or sweep streets. In line with the Hindu caste system, Dalits must be isolated from the community because they can make people of the upper castes impure simply by looking at them (Nussbaum, 2010). More generally, disgust forms part of what can be considered the psychological immune system, a motivational system involving behaviours aimed at protecting the body from infections that also influence social interactions (Murray & Schaller, 2016; Schaller & Duncan, 2007; Schnall, 2016). In this respect, through an experimental study, Curtis et al., (2004) showed that people were much more disgusted by stimuli that could lead to the transmission of infectious disease, compared to stimuli involving no such danger. Thus, disgust may communicate a potentially dangerous social situation and therefore makes health concerns salient. For these reasons, we supposed that feelings of disgust would be associated with the biological kind of dehumanizing perception. Specifically, by integrating the literature on disgust (e.g., Nussbaum, 2010; Oaten et al., 2009) with that of biologization (e.g., Savage, 2007; Sontag, 2002) and physically dirty work (Hughes 1951, 1958; Douglas, 1966), we hypothesized that the dirty work environments characterizing physically dirty occupations would elicit laypeople’s disgust towards these workers. In turn, disgust would increase the association of these physically tainted workers with biological metaphors. Study 1 was designed to experimentally verify the causal link between degrading work environments and increased feelings of disgust towards pre-selected physically tainted workers (i.e., a garbage collector and a janitor), which, in turn, would lead to increased biological dehumanization of workers. To do so, we employed visual stimuli (i.e., video clips) that depicted a garbage collector and a janitor performing their daily activities – that is, sweeping a street and cleaning a restroom, respectively. The two occupations and videos were selected through preliminary studies described below. We manipulated the participants’ attentional focus while they viewed these video clips (for a similar procedure, see Andrighetto, Baldissarri, & Volpato, 2017; Heflick et al., 2012). Depending on the experimental condition, the participants were prompted to focus on the environment (environment-focus condition) or on the person in the video (person-focus condition). We supposed that if it is true that disgust can be ‘projective’ (Nussbaum, 2010; Rozin et al., 1986), then focusing on the dirty work environment that characterizes physically tainted occupations would promote disgust towards people who work in such an environment. In addition, our hypothesis was backed-up by several authors (Buckels & Trapnell, 2013; Curtis & Biran, 2001; Haidt, McCauley & Rozin, 1994; Mikolić, 2016; Rozin et al., 2008), according to which bodily fluids and dirty environments can be considered culturally universal elicitors of disgust. Moreover, in order to demonstrate the importance of disgust in the severity of moral judgements, it is noteworthy that Schnall et al., (2008) used a dirty work setting to experimentally manipulate participants’ disgust levels. In line with our hypotheses, the procedure employed by the authors further demonstrated the relevant role of a dirty workspace in eliciting feelings of disgust. For these reasons, we assumed that focusing on the work environment (vs. the person) would increase perceptions of the targets as associated with contagion and reflect biological dehumanization via increased feelings of disgust. Finally, to provide evidence that the effect of work environments via disgust on dehumanizing perception is a peculiar process of biological dehumanization, two other forms of dehumanization (i.e., animalization and objectification, namely, the consideration of a certain group of people as more similar to animals or objects rather than to human beings; Volpato & Andrighetto, 2015) were considered in the study. Literature (e.g., Valtorta, Baldissarri, Andrighetto, & Volpato, 2019) has demonstrated that objectification and animalization are not linked to the dirtiness of work settings. Therefore, we expected to find the effect of the work environment via disgust only on the biological kind of dehumanizing perception. The occupational groups (i.e., garbage collector and janitor jobs) were selected through a preliminary study aimed at identifying the most salient tainted occupations in the Italian context.1 After citing some tainted occupations, thirty-three participants (18 females; M = 32.36, SD = 15.94) were asked to assess the extent to which (1 = not at all; 7 = extremely) each type of work was socially, morally and physically tainted in Italian society. Before answering, volunteers received a definition of each type of taint (Ashforth & Kreiner, 1999). Through a series of paired-sample t-tests, we selected the occupations with the highest score for one type of taint and the lowest scores on the other two. In particular, we found that garbage collectors and janitors were evaluated as more physically tainted – M = 6.83, SD = 0.38 for garbage collectors; M = 6.97, SD = 0.18 for janitors – than socially – M = 6.07, SD = 1.26; t(29) = 3.04, p = 0.005, d = 0.55 for garbage collectors; M = 6.37, SD = 0.96; t(29) = 3.52, p < 0.001, d = 0.64 for janitors – or morally – M = 1.50, SD = 0.86; t(29) = 28.41, p < 0.001, d = 5.18 for garbage collectors; M = 1.33, SD = 0.66; t(29) = 46.14, p < 0.001, d = 8.42 for janitors – tainted. Participants and experimental design. One hundred and sixty (119 females) Italian volunteers participated in the study. The participants’ ages ranged from 18 to 49 years (M = 24.17, SD = 4.1). A 2 (focus: environment vs. person) × 2 (target: garbage collector, janitor) design was used, with the target as a within-subjects variable and the focus as a between-subjects variable. The participants were randomly allocated to the experimental conditions. A post hoc power analysis was conducted with G*Power 3.1. With an alpha level of 0.05, a sample size of 160, and the largest effect size we found in our results (f2 = 0.33), the achieved power for the study was 0.99. Procedure and measures. The participants took part in an online study introduced as a task that involved ‘impression formation’ of other people. To manipulate the focus, before they watched the video, the participants were instructed to focus either on the environment in the clip (environment-focus condition) or on the target shown in the clip (person-focus condition). Each participant watched two videos: one depicting the garbage collector and the other depicting the janitor. The presentation order of the two videos was counterbalanced across participants. After the participants viewed each video, they completed a measure assessing feelings of disgust towards the target and a measure assessing the perceptions of the target as virus-like, animal-like, object-like and as a human being. Finally, the participants completed a manipulation check item, submitted their demographic information and were fully debriefed and thanked. Videos. The two video clips, which were downloaded from freely available online sources, were both 65 seconds long and depicted two non-famous individuals performing their daily work tasks. The garbage collector clip depicted a man sweeping a street. The janitor clip showed a man cleaning a restroom. Both workers wore their respective work uniforms. These two videos were selected from an initial pool of six clips (three for each occupation). Thirty volunteers (18 females; M = 29.10, SD = 9.81), who were blind to the study aims, evaluated each type of work depicted in the videos in terms of the work characteristics (e.g., useful – reversed, subordinate, boring; α = 0.78) and the features of the environment (e.g., dirty, degrading, dangerous; α = 0.90) using a 7-point scale (1 = not at all; 7 = extremely). We selected the two videos (one for each occupation) with the highest environment score in terms of dirt, and we controlled the chosen clips through a series of t-tests. The results revealed that there were no significant differences between the two occupations regarding work characteristics, t(22) = 0.38, p = 0.701, d = 0.02, and environment features, t(27) = –1.37, p = 0.183, d = 0.51. Furthermore, the targets depicted in the videos were evaluated in terms of perceived pleasantness, familiarity, and socio-economic status. The participants rated the pleasantness (“How pleasant is the target filmed in the video?”) and familiarity (“How familiar is the target filmed in the video?”) of the garbage collector and the janitor on a 7-point scale (1 = not at all; 7 = extremely). To measure the perceived socio-economic status, the participants were asked to indicate the status of the workers (low, middle, high). A series of t-tests showed that there were no significant differences between the two targets in terms of the ratings of perceived pleasantness, t(26) = 0.22, p = 0.823, d = 0.01, familiarity, t(25) = –0.36, p = 0.724, d = 0.02, and socio-economic status, t(28) = 0, p = 1.00, d = 0.00. Focus manipulation. In the environment-focus condition, the participants read these instructions on the computer screen: “You are going to view a video clip. Please focus on the environment filmed in the video while you watch”. In the person-focus condition, the word “environment” was replaced with “person”. Feelings of disgust. Perceptions of disgust towards the workers were measured using eight disgust-related words (e.g., disgust, aversion, pleasure – reversed, nausea, distaste, revulsion, appreciation – reversed, and attraction – reversed; α = 0.86) borrowed from previous research (e.g., Buckels & Trapnell, 2013; Dasgupta et al., 2009). In particular, the participants were asked to rate the extent to which they felt disgust towards each target by answering on a 7-point Likert scale (1 = not at all; 7 = extremely) the following question: “How much do you feel [disgust] towards the target filmed in the video?”. Measures of dehumanization. To measure dehumanization, the participants were asked to rate the extent to which the target was associated with different sets of words (1 = not at all; 7 = extremely). The perceptions of the target as virus-like and animal-like were measured using four virus-related nouns (virus, contamination, filth, and contagion; α = 0.85) and four animal-related nouns (animal, savage, primitive, and beast; α = 0.80) borrowed from the literature concerning dirtiness and dehumanization (e.g., Douglas, 1966; Savage, 2007; Speltini & Passini, 2014; Steuter & Wills, 2010; Tipler & Ruscher, 2014). Perceptions of each target as object-like were instead measured employing six object-related words (object, tool, device, thing, instrument, and number; α = 0.85; see Andrighetto et al., 2017; Rudman & Mescher, 2012). Perceptions of the target as a human being were measured using five human-related words (human being, person, individual, subject and citizen; α = 0.93; see, e.g., Capozza et al., 2012). To obtain a different index for each dehumanization form, we computed three scores. The biologization score resulted from the difference between the virus-related words and the human-related words, the animalization score resulted from the difference between the animal-related words and the human-related words, and the objectification score resulted from the difference between the object-related words and the human-related words. In this respect, higher scores indicated stronger perceptions of the target as virus-like, animal-like or object-like than as a human being (for a similar procedure, see Andrighetto et al., 2017). Manipulation check item. After completing the scales, the participants were asked to indicate what they focused on while viewing the video (environment vs. person). Twenty-four participants were excluded from the study because they failed the manipulation check and therefore were not considered in the main analyses.2 The final sample considered for the analyses was of 136 participants (103 females; M = 24.40, SD = 3.64). Feelings of disgust. We performed a 2 (focus: environment vs. person) × 2 (target: garbage collectors, janitor) ANOVA with repeated measurements on participants’ perceptions of disgust towards the workers. The analysis yielded the expected main effect of focus, F(1,134) = 66.09, p < 0.001, ηp2 = 0.33: the participants perceived more disgust towards each target when they were primed to focus on his work environment (Mgc = 4.34, SDgc = 0.83; Mj = 4.42, SDj = 0.78) rather than on the person himself (Mgc = 3.46, SDgc = 0.60; Mj = 3.53, SDj = 0.72; see Figure 1). Instead, neither the main effect of target, F(1,134) = 1.25, p = 0.266, ηp2 = 0.01, nor the interaction of target × focus manipulation, F(1,134) = 0.02, p = 0.896, ηp2 = 0.00, was significant. Study 1: Perceptions of disgust as a function of focus manipulation. Measures of dehumanization. A MANOVA with repeated measurements was conducted to analyse the effects of focus (focus: environment vs. person) on the participants’ dehumanized perceptions of the workers. The multivariate test revealed a main effect of focus, λ = 0.63, F(1,134) = 26.24, p < 0.001, ηp2 = 0.37. As reported below, univariate tests showed a significant effect of focus on dehumanization scores. Biologization. The analysis showed a main effect of focus, F(1,134) = 38.80, p < 0.001, ηp2 = 0.22, indicating that the participants biologized more the two workers when they were primed to focus on the work environment (Mgc = –2.39, SDgc = 1.64; Mj = –2.75, SDj = 1.86) rather than on the person (Mgc = –4.59, SDgc = 1.92; Mj = –4.50, SDj = 2.34). Instead, the main effect of the target was not significant, F(1,134) = 1.64, p = 0.203, ηp2 = 0.01. Furthermore, we found that the interaction of target × focus manipulation was significant, F(1,134) = 4.30, p = 0.040, ηp2 = 0.03, indicating that when participants were primed to focus on the work environment, they biologized the garbage collector more than the janitor. Despite this latter unexpected finding, these results overall confirmed our hypothesis: participants dehumanized the two physically dirty workers in a more biological way when they were primed to focus on the work environment rather than on the person (see Figure 2). Study 1: Perceptions of biologization as a function of focus manipulation (the biologization score resulted from the difference between the virus- and the human-related words; higher scores indicated stronger perceptions of the target as virus-like than a human being). Animalization. Regarding animalization, the analysis did not yield a main effect of focus, F(1,134) = 1.91, p = 0.169, ηp2 = 0.01. Neither the effect of target, F(1,134) = 0.41, p = 0.523, ηp2 = 0.00, nor the interaction of target × focus manipulation, F(1,134) = 0.16, p = 0.691, ηp2 = 0.00, was significant. Objectification. Regarding the objectification score, the main effects of both the focus, F(1,134) = 2.08, p = 0.152, ηp2 = 0.02, and target, F(1,134) = 0.29, p = 0.589, ηp2 = 0.00, were not significant. In the same vein, the interaction of the target × focus manipulation, F(1,134) = 2.06, p = 0.154, ηp2 = 0.02, was not significant. Study 1: Disgust mediates the relation between focus manipulation (1 = environment, 0 = person) and biologization (unstandardized estimates; estimate of the mediated model is in parentheses). **p ≤ 0.01; ***p ≤ 0.001. Importantly, this mediation pattern did not emerge for animalization, the point estimate was 0.02, and the 95% CI was [–0.38, 0.51], and objectification, the point estimate was 0.02, and the 95% CI was [–0.64, 0.69]. In Study 1, despite the mean ratings of each dehumanizing perception being negative in all conditions – indicating a weak association of the targets with virus-, animal- and instrument-related words – we found that focusing on the physically tainted work environment (vs. on the person performing the work) increased the feelings of disgust towards the workers and their biologization. This study revealed a link between the degrading work environment characterizing physically tainted occupations and increased feelings of disgust towards the workers. Furthermore, we found that this increased disgust leads to an increased association of workers with biological metaphors. Focusing on the work environment increased the participants’ feelings of disgust, which in turn led to a view of the workers as contagious individuals. Importantly, this pattern did not emerge for animalization and objectification. Despite these relevant findings, this study did not allow us to verify whether our results were due to the physical taint and degrading work environments that typically characterize physically stigmatized occupations (Ashforth & Kreiner, 1999), or, rather, to the subordinate and low-status position of these occupations in the society. For this reason, in order to provide a more stringent test for the assumed relationship between physically dirty workers and biological dehumanization, we conducted a second study by using different pre-selected stigmatized activities. Study 2 was designed to further investigate the hypothesized findings of Study 1 by employing a different paradigm and considering different occupational groups. In particular, we aimed to verify the specificity of the link between physically tainted activities and biologization, which we expected would not emerge for other types of low-status occupations. Furthermore, we aimed to increase the generalizability of our results in two ways: by considering a paradigm that used vignettes, a less confounding stimulus material than video clips used in Study 1, and by employing a female target instead of a male target. For this reason and considering that previous investigations have shown that women are characteristically more disgust sensitive than men (Charash, McKay, & DiPaolo, 2006; Olatunji et al., 2007), we decided to use a sample of all women in this study. Using an all-female sample would, therefore, remove a confounding variable. We manipulated the type of work by depicting a janitor (i.e., physically tainted condition), cashier or student to the participants. The cashier was selected as the crucial comparison condition because, similar to the janitor, the work was supposed to be a low-status occupation but was not characterized by a dirty work environment. The student was instead selected as a baseline condition because of its similarity with our sample. In this respect, we assumed that when the participants were shown a description of a cashier (i.e., non-physically tainted condition), they would display lower feelings of disgust and lower biologization compared to those assigned to the physically tainted condition but not compared to those assigned to the baseline condition. Consistent with Study 1, we believed that the degrading work environment would lead participants to biologize the target via increased feelings of disgust. More specifically, considering that people in physical contact with dirt are associated with disease (Faulkner et al., 2004), we first expected that exposure to a physically tainted occupation (vs. non-physically tainted occupation vs. baseline condition) – specifically selected for the perceived work environment in terms of dirt – would be directly related to degrading work environment perceptions. In turn, such a perception would be positively related to increased feelings of disgust towards the worker. Finally, this emotion would be reflected in a greater tendency to associate the target with biological metaphors. As in the previous study, to provide evidence that the relationship among a dirty work environment, feelings of disgust and biologization is a peculiar process of this specific form of dehumanization, we also considered in this study animalization and objectification. The occupational groups (i.e., janitor and cashier jobs) were pre-tested in terms of the perceived work environment (e.g., degrading, dangerous, polluting; α = 0.85), work activity (e.g., independent – reversed, subordinate, conditioned; α = 0.78) and socio-economic status. Fifty participants (41 females; M = 34.79, SD = 10.93) who were blind to the study aims rated the work environment and work activity of the janitor or the cashier on a 7-point scale (1 = not at all; 7 = extremely). To measure perceived socio-economic status, the participants were asked to indicate the status of the worker (low, middle, high). The independent sample t-test showed that there were no significant differences between the two targets in terms of the ratings of perceived work activity, t(48) = –0.86, p = 0.392, d = 0.23, and socio-economic status, t(48) = –1.92, p = 0.069, d = 0.54. For the perceived work environment, we found a significant difference between the two targets, t(48) = 5.03, p < 0.001, d = 1.43, indicating that in the janitor condition (M = 4.61, SD = 1.14), the work environment was perceived as dirtier than the work environment in the cashier condition (M = 3.13, SD = 0.91). Participants and experimental design. Seventy-one undergraduate students participated in the study. The participants’ ages ranged from 18 to 78 years (M = 30.46, SD = 17.06). The study was a one-way, between-subjects design with three levels (work: physically tainted vs. non-physically tainted vs. baseline condition). The participants were randomly allocated to the experimental conditions. A post hoc power analysis was conducted and demonstrated that with an alpha level of 0.05, a sample size of 71, and the largest effect size we found in the study (f2 = 0.93), the achieved power was 0.99. Procedure and measures. The experiment was administered online, and it was introduced as a task involving ‘impression formation’. The participants were first randomly assigned to read one of three vignettes describing a janitor (physically tainted condition), a cashier (non-physically tainted condition) or a student (baseline condition) named Maria.4 After reading the description, all of the participants completed a questionnaire using the scales described below. Finally, the participants were asked for their demographic information and were thanked and fully debriefed. Maria is twenty-seven years old and lives in Milan. She works as a janitor at the University of Milano-Bicocca. She works as a cashier at the canteen of the University of Milano-Bicocca. She is an undergraduate student at the University of Milano-Bicocca. Perceptions of the work environment. Perceptions of the work environment were measured using eight adjectives (dirty, polluting, harmful, degrading, dangerous, noxious, clean – reversed, and refined – reversed; α = 0.84). The participants were asked to rate the extent to which the considered work environment was characterized by these adjectives on a 7-point Likert scale (1 = not at all; 7 = extremely). Feelings of disgust. Perceptions of disgust were identified using the same measure that was used in Study 1. The participants were asked to rate the extent (1 = not at all; 7 = extremely) to which they perceived disgust (α = 0.70) towards the target. Measures of dehumanization. To measure the dehumanizing perceptions of the target, the participants were asked to rate the extent to which the target was associated with the virus-related words (α = 0.66), animal-related words (α = 0.23),5 and instrument-related words (α = 0.83) employed in Study 1. Perceptions of the target as a human being were measured using human-related words (α = 0.77) employed in Study 1. As in the previous study, to obtain an index for each dehumanization form, we computed the three scores that resulted from the difference between each dehumanizing score and the human-related score. Manipulation check item. After completing the scales, the participants were asked to indicate the occupation of the target (janitor vs. cashier vs. student). Two participants were excluded from the study because they failed the manipulation check and therefore were not considered in the main analyses. The final sample considered for the analyses was of 69 participants (M = 30.46, SD = 17.06). We performed two one-way between-subjects (work: physically tainted vs. non-physically tainted vs. baseline condition) ANOVAs on the participants’ perceptions of work environment features and feelings of disgust. Perceptions of the work environment. Regarding work environment features, the analysis showed a main effect of work, F(2,66) = 7.99, p = 0.001, ηp2 = 0.19, indicating that in the physically tainted condition (M = 3.44, SD = 1.13), the work environment was perceived as dirtier than the work environment in the non-physically tainted (M = 2.65, SD = 0.57), p = 0.005, and baseline (M = 2.41, SD = 0.92) conditions, p < 0.001. Furthermore, the participants’ mean score in the non-physically tainted and baseline conditions did not significantly differ (p = 0.364). Feelings of disgust. Regarding feelings of disgust, we found a main effect of work, F(2,66) = 3.27, p = 0.044, ηp2 = 0.09: in the physically tainted condition (M = 3.16, SD = 0.87), the participants perceived more feelings of disgust towards the worker than in the non-physically tainted (M = 2.73, SD = 0.42), p = 0.023, and baseline (M = 2.78, SD = 0.49) conditions, p = 0.038, while the participants’ mean score in the non-physically tainted and baseline conditions did not significantly differ (p = 0.816). Measures of dehumanization. A MANOVA was conducted to analyse the effect of the type of work (work: physically tainted vs. non-physically tainted vs. baseline condition) on the participants’ dehumanized perceptions of the targets. The multivariate test revealed a main effect of work, λ = 0.37, F(2,66) = 13.70, p < 0.001, ηp2 = 0.39. As reported below, univariate tests showed a significant effect of work on dehumanization scores. Biologization. The analysis showed a significant effect of work, F(2,66) = 5.41, p < 0.001, ηp2 = 0.93, indicating that in the physically tainted condition, the worker was more biologized (M = –3.79, SD = 1.72) than in the non-physically tainted (M = –4.63, SD = 1.14), p = 0.032 and in the baseline conditions (M = –5.01, SD = 0.86), p = 0.002. Furthermore, the participants’ mean scores in the non-physically tainted and baseline conditions did not significantly differ (p = 0.305). Animalization. Regarding animalization, the analysis did not yield an effect of work, F(2,66) = 2.77, p = 0.070, ηp2 = 0.08. Objectification. Regarding the objectification score, the effect of work, F(2,66) = 4.45, p = 0.015, ηp2 = 0.12, was significant, indicating that participants in the non-physically tainted condition perceived the worker (M = –3.60, SD = 1.70) as more similar to an object than participants in the physically tainted (M = –4.59, SD = 1.64), p = 0.026, and baseline conditions (M = –4.79, SD = 0.93), p = 0.007. Furthermore, the participants’ mean score in the physically tainted and baseline conditions did not significantly differ (p = 0.637). The role of disgust in the biologization of physically tainted workers. To investigate whether the type of work predicted biologization via work environment and disgust towards the target, we tested a double mediation model in which the type of work was considered the predictor variable, the work environment was the first-level mediator, disgust was the second-level mediator and biologization was the outcome variable. The double mediation hypothesis was tested using Hayes’ (2013) PROCESS macros (Model 6) and the bootstrapping method (5,000 resamples). Since the independent variable was multicategorical, by following the recommendations of Hayes and Preacher (2014), we used indicator coding. The physically tainted condition was coded as the reference condition and was compared to the non-physically tainted condition (D1) and baseline condition (D2) separately. It was noteworthy that this pattern did not emerge when animalization and objectification were entered as dependent variables. Regarding animalization, the point estimate was 0.07, and the 95% CI was [–0.01, 0.32] for D1; the point estimate was 0.09, and the 95% CI was [–0.02, 0.40] for D2. A similar result emerged for objectification: the point estimate was 0.11, and the 95% CI was [–0.00, 0.44] for D1; the point estimate was 0.14, and the 95% CI was [–0.01, 0.54] for D2. Study 2: Model testing the indirect effect from the type of work to biologization through work environment perceptions and feelings of disgust (unstandardized estimates; estimate of the mediated model is in parentheses). *p ≤ 0.05; **p ≤ 0.01; ***p ≤ 0.001. Despite the mean ratings of each dehumanizing perception being negative in all conditions – indicating a weak association of the targets with virus-, animal- and instrument-related words – by relying on text vignettes describing a janitor, a cashier or a student, in this study, we found that the type of work predicted a biologized view of the worker. In particular, simply reporting a physically tainted occupation (vs. baseline condition) increased the participants’ feelings of disgust and biological dehumanization towards the target. In contrast, reporting a non-physically tainted occupation (vs. baseline condition) had no effects on feelings of disgust and biologization of the worker. Thus, the janitors (i.e., physically tainted workers) but not the cashiers (i.e., non-physically tainted workers) appear to be dehumanized in a biological way. Furthermore, in line with Study 1, Study 2 revealed that the physically tainted occupation (vs. non-physically tainted occupation and vs. baseline condition) led to degrading work environment perceptions and, in turn, to increased feelings of disgust. Finally, this increased disgust led to an increased biologization. Importantly, this pattern did not emerge for animalization and objectification. The main aim of these studies was to demonstrate that the dirty work environment characterizing certain physically dirty occupations elicits people’s disgust towards workers. In turn, disgust would increase the association of these physically tainted workers with biological metaphors. Our findings supported our expectations. 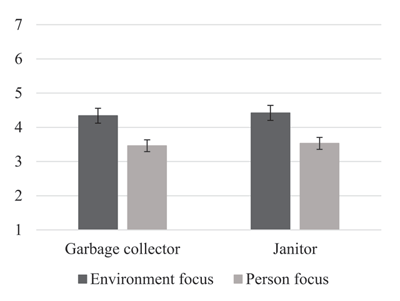 In Study 1, in which the work environment features were made salient using video clips that depicted a garbage collector and a janitor while they performed their manual work activities, we employed an experimental paradigm used in previous research (Heflick et al., 2012; Andrighetto et al., 2017) and found that, compared to those who focused on the workers’ person, the participants who focused on the workers’ work environment more strongly perceived the targets as virus-like – and thus biologized (see also the supplementary analyses in the additional material) – and felt more disgust towards them. Importantly, the focus effect did not emerge for the perceptions of workers as animal-like and object-like. 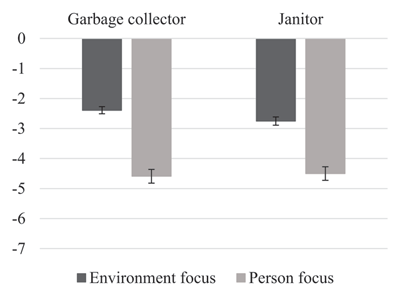 Regarding the focus effect, it is noteworthy that when participants were primed to focus on the work environment, they biologized the garbage collector more than the janitor. This unexpected result is consistent with the idea that people experiencing fear of pathogen transference show a significantly greater preference for and valuation of cleansing products (e.g., Galoni & Noseworthy, 2015). Coherently, when participants were asked to rate the janitor, who works with cleansing supplies and whose activity is to sanitize things, they didn’t show the same level of association with viruses as when they were asked to rate the garbage collector. In addition, this study showed that focusing on the work environment increased the perception of disgust, which in turn was significantly related with a higher biologization score. Study 2 expanded these findings by verifying the specificity of the link between physically tainted activities and biologization. In particular, we expected that this peculiar form of dehumanization would not emerge for other types of low-status occupations that are not characterized by a dirty work environment. Therefore, participants were exposed to a description of a janitor (i.e., physically tainted condition), a cashier (i.e., non-physically tainted condition) or a student (i.e., baseline condition). By employing a paradigm that used vignettes, which is less confounding stimulus material than the video clips used in Study 1, we found that the janitors – but not the cashiers – were dehumanized in a biological way (see also the supplementary analyses in the additional material). Furthermore, in line with Study 1, Study 2 revealed that the physically tainted occupation (vs. non-physically tainted occupation and vs. baseline condition) led to degrading work environment perceptions and, in turn, to increased feelings of disgust. Finally, this increased disgust led to increased biologization. Importantly, this pattern did not emerge for animalization and objectification, confirming that the relationship between the work environment and disgust is a peculiar process that triggered only one particular form of dehumanization – that is, biologization. Regarding this causal path, it is noteworthy that in Study 1, we found a bidirectional effect between biologization and disgust (see Note 3). In particular, we found that focusing on the work environment predicted disgust towards the workers via biologization. This unexpected, alternative and significant pattern leads us to not exclude the existence of a bidirectional effect between disgust and biologization. However, both the previous literature on the role of emotions in dehumanization processes (see Buckels & Trapnell, 2013; Hodson & Costello, 2007) and the findings of Study 2 – in which the bidirectional effect between biologization and disgust was not confirmed (see Note 6) – suggest that disgust is perhaps a more reliable mediator and antecedent of dehumanizing perceptions, such as biologization. Study 2 further generalized our findings by demonstrating that the physically tainted occupation led to degrading work environment perceptions and in turn to increased feelings of disgust and increased biologization also when the target was a female worker. Moreover, with regard to Study 2, it is important to note that participants in the non-physically tainted condition perceived the worker as more similar to an object than participants in the physically tainted and baseline conditions (see also the supplementary analyses in the additional material). In other words, a low-status occupation not characterized by a dirty work environment led to an objectified view of the target. This result is in line with other studies about dehumanization related to the work domain. For example, as reported by LaCroix and Pratto (2015), a set of studies conducted by Gruenfeld et al., (2008) examined objectification as a response to social power and found that in hierarchical work contexts, the participants in high-power positions systematically objectified their subordinates by seeing them as instruments for the attainment of their own purposes. In parallel, Andrighetto, Baldissarri, and Volpato (2017; see also Baldissarri et al., 2017; Volpato, Andrighetto, & Baldissarri, 2017 for a review) revealed that (factory) workers performing subordinate activities characterized by repetitive movements, fragmented activities, and dependence on machines were objectified by laypeople – that is, perceived as instrument-like (vs. a human being) and as less able to experience human mental states. In this respect, by integrating our findings with previous research (e.g., Andrighetto et al., 2017; Valtorta et al., 2019), it is plausible to think that objectification and biologization should differently apply to distinct tainted occupational categories. On the one hand, objectification seems to be related to the work activities. On the other hand, biologization seems to be associated with the work environment. Thus, from our point of view, an occupational group would be both objectified and biologized in the presence of high degrees of the repetitiveness of movements, fragmentation of activities, dependence on the machines and a dirty work setting. Taken together, we believe that our findings make a novel contribution to the literature in different ways. First, by integrating the theoretical assumptions regarding dirty occupations, feelings of disgust and dehumanization, they reveal how certain features related to the work environment are an important source of dehumanizing perceptions in terms of biologization. To our knowledge, no previous research has empirically assessed the biological perceptions related to metaphors concerning disease and contagion. Through the present research, we proposed the first experimental evidence of biologization and expanded its analysis in a non-extreme context – that is, in the daily workplace. We found that physically tainted workers who operate in particularly dirty environments can be perceived by laypeople as infected and contagious. Furthermore, the present research expands the sociological literature on stigma linked with dirty work. Our findings appear to confirm some theoretical assumptions (Ashforth & Kreiner, 1999; Hughes, 1962; Nussbaum, 2010) regarding the contagious disposition of dirty work: when the dirtiness is pervasive, the occupation is perceived as dirty work, and by extension, the individuals who perform it become dirty workers, in a literal sense. In particular, the workers’ work environment increases the participants’ feelings of disgust towards the targets who are seen more as virus-like than animal and instrument-like. This process can have detrimental consequences for workers who perform dirty work because they can be excluded from social interactions because of the threat of infection (Ashforth & Kreiner, 1999; Nussbaum, 2010). Despite the novelty of our studies, there are some limitations that should be considered in interpreting our findings and should guide future research. The main methodological limitation concerns the (explicit) measures that we employed in our studies. In particular, it is important to note that in both Studies 1 and 2, the mean ratings of each dehumanizing perception (i.e., biologization, animalization, and objectification), despite varying according to the focus and target manipulation, were negative in all conditions, indicating a weak association of the targets with virus-, animal- and instrument-related words. However, it should be noted that our measure assessed the association between the target and dehumanized perceptions using a self-report measure, which may have been affected by the participants’ desirability concerns (e.g., Crowne & Marlowe, 1964; Nederhof, 1985). Greater associations with dehumanizing metaphors may emerge in studies using a subtler measure of dehumanization and implicit techniques, which are less susceptible to motivated responding (Gawronski & Bodenhausen, 2006). Furthermore, it is noteworthy that in Study 1, many participants (N = 24) were excluded from the analyses because they failed the manipulation check. This could be explained by the fact that we ran the study online, and thus, we did not have sufficient control over the participants’ responses or their attention to the presented video clips. A more controlled setting may be facilitated through laboratory studies. With regard the stimulus material employed in Study 1, although we pre-tested the video clips, we cannot exclude the possibility that the different participants’ perceptions of the targets were determined by factors beyond the work environment. Future research should corroborate our findings by employing a variety of videos different than those used in the present work. Moreover, it is important to note that, unlike Study 1, in Study 2 we considered only female participants. Further studies should replicate our results by adopting a more heterogeneous sample. As for feelings of disgust, we believe that future research should extend our results in different ways. First, considering that disgust is an emotion that shows variance between individuals (e.g., Olatunji at al., 2007), future studies should replicate our findings by controlling for the possible moderating effect of disgust sensitivity. Further, in order to demonstrate the ‘projective disposition’ of disgust that leads people to project disgust from a dirty environment onto workers who are employed in such an environment (e.g., Nussbaum, 2010), we think that further investigations should replicate our results by adding a specific measure of this emotion towards a dirty work setting. Dehumanization processes occur when people perceive others as belonging to a lower order of humanity. They are therefore a powerful means of legitimizing social inequalities. Among the different forms of dehumanization, so far, biological dehumanization has been theoretically examined within conflictual intergroup relations. In our research, we showed that it also emerges within the work domain and may thus serve to justify the subordination of certain occupational groups. Crucially, we found that the relationship between dirty work environments and increased worker biologization is explained by increased feelings of disgust. In this sense, disgust has a crucial role: in line with Nussbaum (2010), disgust expresses human discomfort that is usually used politically to subordinate and socially exclude vulnerable minorities, such as workers who perform their job in degrading and dirty environments. For these reasons, a greater understanding of the conditions that affect people’s perceptions of workers is essential to prevent the negative consequences of particularly demeaning work settings. 1In this study, we considered part of the database obtained from the preliminary study. Remaining data have been considered in Valtorta et al., (2019). 2Many participants (N = 24) were excluded from the analyses because they failed the manipulation check. This could be explained by the fact that we ran the study online, and thus, we did not have sufficient control over the participants’ responses or their attention to the presented video clips. 3We also tested a mediation pattern in which the focus was considered the predictor variable (1 = environment, 0 = person), biologization as the mediator variable and disgust towards the workers as the outcome variable. The analysis showed that focusing on the work environment increased biologization, a = 1.97, SE = 0.32, t(1,134) = 6.23, p < 0.001. In turn, higher levels of biologization were significantly related with an increased perception of disgust, b = 0.08, SE = 0.03, t(2,133) = 2.77, p = 0.006. Furthermore, the indirect effect of the focus on disgust via biologization emerged as significant: the point estimate was 0.16, and the 95% CI was [0.02, 0.35]. However, considering that our hypothesized model is supported by the literature on the role of emotions in dehumanization processes (e.g., Buckels & Trapnell, 2013; Hodson & Costello, 2007), we think that disgust can be considered a reliable mediator of the relationship between dirty work environments and biologization. 4To further generalize our findings regarding physically tainted workers, we decided to employ a female target. 5Because of its low reliability, for the animalization score, we decided to only employ the two items that we consider the core dimensions of animalization – that is, animal and beast (r = 0.25, n = 69, p = 0.041). 6We also tested a pattern in which the type of work predicted feelings of disgust via the work environment and biologization. Therefore, the type of work was considered the predictor variable, the work environment was the first-level mediator, biologization was the second-level mediator and disgust was the outcome variable. 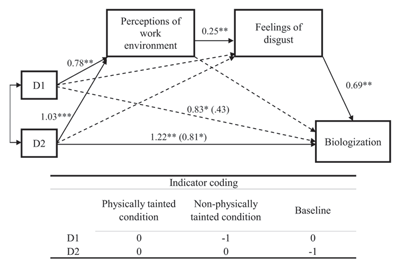 The indirect effect of both D1 (physically tainted condition vs. non-physically tainted condition) and D2 (physically tainted condition vs. baseline condition) on feelings of disgust via degrading work environment perceptions and biologization were not significant: the point estimate was 0.04, and the 95% CI was [–0.01, 0.16] for D1; the point estimate was 0.05, and the 95% CI was [–0.01, 0.24] for D2, thus not supporting this double mediation model. Douglas, M. (1966). Purity and danger: An analysis of concepts of pollution and taboo. London: Routledge and Kegan Paul. Hirsch, H., & Smith, R. W. (1991). The language of extermination in genocide. In I. W. Charny (Ed. ), Genocide: A Critical Bibliographic Review (vol. 2, pp. 386–403). London: Mansell Publishing. Hughes, E. C. (1951). Work and the self. In J. H. Rohrer, & M. Sherif (Eds. ), Social psychology at the crossroads (pp. 313–323). New York: Harper & Brothers. Hughes, E. C. (1958). Men and their work. Glence, IL: Free Press. LaCroix, J. M., & Pratto, F. (2015). Instrumentality and the denial of personhood: The social psychology of objectifying others. Revue Internationale de Psychologie Sociale, 28, 183–211. Neuberg, S. L., & Cottrell, C. A. (2002). Intergroup emotions: A biocultural approach. In D. M. Mackie, & E. R. Smith (Eds. ), From prejudice to intergroup emotions: Differentiated reactions to social groups (pp. 265–283). New York: Psychology Press. Nussbaum, M. (2010). From disgust to humanity: Sexual orientation and constitutional law. New York: Oxford University Press. Rozin, P., Haidt, J., & McCauley, C. R. (2008). Disgust. In M. Lewis, J. M. Haviland-Jones, & L. F. Barrett (Eds. ), Handbook of emotions (3rd ed., pp. 757–776). New York: Guilford Press. Schaller, M., & Duncan, L. A. (2007). The behavioral immune system: Its evolution and social psychological implications. In J. Forgas, M. G. Haselton, & W. von Hippel (Eds. ), Evolution and the social mind: Evolutionary psychology and social cognition (pp. 293–307). New York: Psychology Press. Sontag, S. (2002). Illness as metaphor and AIDS and its metaphors. London: Penguin Classics.